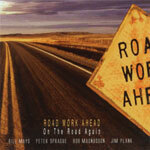 CD review: "On the Road Again"
Road Work Ahead is an on-again, off-again San Diego all-star jazz combo with roots going back almost a quarter-century. Happily for jazz fans, the band is on-again, with a new album out. "On the Road Again" was recorded last year when New York-based pianist Bill Mays returned to town for a visit with family and performed a few gigs with his old bandmates, guitarist Peter Sprague, bassist Bob Magnusson and drummer Jim Plank. One of the gigs ended up being in Sprague's Encinitas studio. The result is a collection of seven new songs by the band members and four covers that show off both their remarkable virtuosity and the kind of empathetic interplay that only comes with time. Mays left Southern California 20 years ago for the Big Apple, and the move has paid off professionally for him, significantly raising his profile in the jazz world. If still not famous as a lead player, his skill is attested to by the fact that Mays was Sarah Vaughan's pianist at one point. His playing on this album is elegant and dynamic, able to shift moods quickly, both helping propel the rhythm and dancing atop it. But Mays is more than a giant in his own right here; he also pushes Sprague beyond where the Del Mar-based guitarist would go on his own. A man of practically limitless talent, Sprague has a tendency when leading his own groups to stay too far within himself  to not push his playing beyond an envelope of safety and comfort. Sprague's playing is always pleasant and listenable  but here he ventures further afield from his bubbly beach jazz into some serious, straight-ahead work that shows a side to his playing we don't always get to hear. There's even a touch of bop on his own composition, "As It Is, As You Are," and Plank's "Bark, Bark." If Magnusson and Plank lived and worked in New York with Mays, they would be renowned and rich as the best rhythm section working in jazz today. But they don't; they live in paradise instead, and there's no jazz godhood available for San Diegans, not even those like Magnusson who played bass for the great Buddy Rich (as well as joining Mays in Vaughan's band in the early '70s). And getting to hear Magnusson play a bow on his upright bass is an unexpected joy. Few jazz bassists are as comfortable playing with a bow as Mag, On both "In the Garden" and the Jobim tune "Modinha," Magnusson uses the bow to take the lead melodic theme for a while, giving the songs a texture only rarely heard in jazz. His tone when bowing is deep, rich, full; his playing more akin to that of a cello, as  unlike most jazz bassists  Magnusson is able to become a purely lead musician with the bow, leaving Mays and Plank to create the rhythm behind him. The new songs are gorgeous and complex enough to challenge the musicians and hold the listener's interest; the covers  particularly of "A Nightingale Sang in Berkeley Square"  insightful and fresh. "On the Road Again" is a complete, polished recording of straight-ahead jazz which proves that, no matter how many years between gigs, Road Work Ahead remains a prodigiously talented ensemble capable of creating great music whenever they're together.